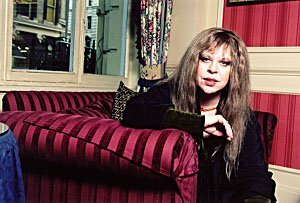 Tanith Lee became a freelance writer in 1975, and has been one ever since. Her first published books were children's fantasies The Dragon Hoard (1971) and Animal Castle (1972). Her first adult fantasy, The Birthgrave (1975), was the start of a long association with DAW, which published more than 20 of her works of fantasy, SF, and horror in the '70s and '80s. She received the British Fantasy Society's August Derleth Award in 1980 for Death's Master (1979), World Fantasy Awards for Best Short Story in 1983 (for ''The Gorgon'') and 1984 (for ''Elle est Trois (La Mort)''). In the last five years, she has had books in a variety of genres published: dark fantasy collection Nightshades (1993), YA fantasy Gold Unicorn (1994), SF Eva Fairdeath (1994), horror novel Vivia (1995), alternate-Victorian dark fantasy Reigning Cats and Dogs (1995), moody modern fantasy When the Lights Go Out (1996), and a historical novel of the French Revolution, The Gods Are Thirsty (1996). ''Writers tell stories better, because they've had more practice, but everyone has a book in them. Yes, that old cliché. If you gave the most interesting (to the person who's living it) life to a great writer, they could turn it into something wonderful. But all lives are important, all people are important, because everyone is a book. Some people just have easier access to it. We need the expressive arts, the ancient scribes, the storytellers, the priests. And that's where I put myself: as a storyteller. Not necessarily a high priestess, but certainly the storyteller. And I would love to be the storyteller of the tribe!" ''I was very interested by the eastern idea of death as a woman, which I used in the 'Flat Earth' books. In the type of eastern literature where death was personified as a woman; women were considered dangerous and untamed and pariah material, and that was why death was in female form. Conversely, in the western literature where I came across death personified as a male, it was because men were seen as powerful, and death was seen as powerful, so he had to be male. So it's two ways of looking at death, as well as two ways of looking at gender." ''I have to write longhand, and no one can read my writing, I have to type my own manuscripts, because I'm going almost in a zigzag, across and then down. (I don't write backwards, I've never been able to do that!) Fortunately, it's not like a circus trick where, when they try to work out how they did it, they're unable to do it. If I can't see something enough, I shut my eyes and look at it, and I don't feel I am writing – I'm there." ''I used to throw away my holograph manuscripts after I'd typed them, but I'm keeping a lot of them now, because obviously, at 50, I'm starting to think, if anyone ever is interested in me after I'm dead, they can look and see, 'My god, this woman was a maniac!'" ''I've written two books set in India: Tamastara , the short stories, and Elephantasm . In the mid-'80s, I just fell for India, and it was like a love affair. I was obsessed with it. I read a few things, and looked at films, and it was as though I was more there than in England, where I was writing! This always happens to me, and it's magical. Later, I saw this person at a signing, and she said, 'Oh, you've obviously lived in India.' I said to her, 'Only mentally.'" ''When I started as a writer, I knew nothing about publishing – nothing about anything! I didn't learn to read until I was nearly eight. My father had to teach me. My mother used to tell me fairy stories, most of which she made up herself, which were wonderful – and many of which I've ripped off for things, subsequently! When I was nine, about a year after I learned how to read, I started to write. Most of my earliest stuff is very Arabian Nights-orientated. Caravans going through the desert... kind of an early version of my later 'Flat Earth' books. And I never stopped writing from then." ''I started a version of my French historical novel The Gods Are Thirsty in 1982, finished that draft at the end of 1984, beginning of '85. Ten years earlier, I saw a play on television, Danton's Death. Amazing play, wonderfully acted! I found it utterly fascinating. I knew nothing at all about the French Revolution, but having seen that play, it sat at the back corner of my brain for a number of years. Then I read something about a newspaperman intimately associated with both Robespierre and Danton. He had this wonderful love story with a beautiful woman called Lucille, who became his wife. And I thought, 'Well, this is a book!'" ''I have one book coming out in the US in 1998, Faces Under Water, from Overlook Press, who also did the 'Paradys Quartet' – and there may be some more of those sometime, set in a parallel Paris. Then I came up with a parallel Venice called Venus. Faces Under Water is an alchemical supernatural thriller, set in a parallel Venice about 1701. Its hero is a very enraged and lost young man who is, in a way, acting as a detective in this water-girt city, and he comes across the most bizarre alchemical plot. In the midst of this is a beautiful woman who suffers from something which we have in our world: her face can't move. She can't show any expression, and she can't talk. She can't even blink or close her eyes. It happens at a time of Carnival, when everyone wears a mask – but her face is the mask. And that is the first book. There are possibly three others, but one more has been bought, which I have yet to write." ''I've also written a big fantasy, very much the sort of thing I used to write, set in kind of a Greek world, though with a lot of differences, called Mortal Suns. It's been offered in the States, but no one will buy it." ''If anyone ever wonders why there's nothing coming from me, it's not my fault. I'm doing the work. No, I haven't deteriorated or gone insane. Suddenly, I just can't get anything into print. And apparently I'm not alone in this. There are people of very high standing, authors who are having problems. So I have been told. In my own case, the more disturbing element is the editor-in-chief who said to me, 'I think this book is terrific. It ought to be in print. I can't publish it – I've been told I mustn't.' The indication is that I'm not writing what people want to read, but I never did." ''The next book I will definitely be doing is the next 'Venus' book. Venus is intimately connected to the city, because she is the star Venus and the water – they don't have one lagoon, they have three. The first book is set about 1701. The second one, Saint Fire, is medieval. There is a misconception that, in medieval times, Venice was ruled very seriously by the priesthood, who kept everybody down, and shut them in terrible dungeons, and did terrible things to them. It isn't true historically, but in 'Venus' it is true. This slave girl, who comes (as many of my heroines do) from nothing to an unwanted prominence, is a kind of Joan of Arc. She finds she can call fire. They're at war with another city, and she's adopted for use as an emblem and a weapon."